I was recently contacted by SocialChorus and asked to participate in Weight Watchers Smart Ones Eat Smart program. Let me start off by saying, I tried Smart Ones a couple of years ago, and to be honest, was LESS than impressed with them. I don't eat many processed frozen foods, but I admit, there are times when they are well...necessary... in this busy world. So I decided I would give SmartOnes a second chance. 1. Portion control so you can eat the foods you love. 2. Breakfast is crucial, because it helps you start your day off right and control your hunger. 3. Smart eating includes a variety of foods with protein. 4. Whole grains, fruits and vegetables can help keep you fuller longer. 5. Smart desserts and snacks can help you stay on track. 6. Support and knowledge are crucial to making smart food choices. You can read more about the 6 Smart Eating Principles HERE. Being on Weight Watchers for some time now, I was pretty familiar with these principles...but what I was really most interested in was TASTE! I used the coupon I was sent to purchase the Smart Beginnings Breakfast Quesadillas. ( I received a coupon for free product from SocialChorus on behalf of SmartOnes Eat Smart Program. All opinions on the product I sampled are mine.) I chose a breakfast item because, for me, that is the one meal I can have problems with. We need to remember to eat breakfast everyday ( Principle #2!) and sometimes I need a really quick, on the go breakfast. The first thing I liked was it came in a two pack. ( Two meals ) Both quesadillas and the two "crisper sleeves" came in the same plastic wrap inside the box. I would have preferred each quesadilla and crisper be packaged separately since I only planned on eating one quesadilla at a time. The package retailed at my store for around $3.00 ( they were on sale). I inserted one of the frozen quesadillas into one of the "crisper sleeves" and microwaved them according to the directions on the box. ( which was 2 minutes on HIGH followed by 1 minute rest time) I really liked that the "crisper sleeve" came with a zipper to easily remove the product. Very nice. When I removed the quesadilla from the sleeve, I cut into the quesadilla and I immediately saw some cheese ooze out. A good sign. It smelled good. Another plus. But how would it taste? Good. Really good. I was impressed. It was warm and cheesy with just the right amount of crispness. It had a nice pepper taste and most importantly, the egg was good. It wasn't rubbery at all. ( I have had that experience with frozen egg products in the past). For me it was pretty filling for 230 calories. I paired it with some fruit for a complete breakfast in under 4 minutes. Give these breakfast quesadillas a try some time. 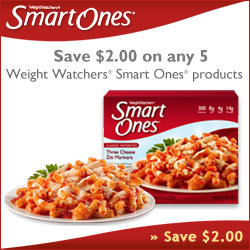 Even if you have tried SmartOnes in the past and didn't care for them...give them another try. You might be pleasantly surprised like I was. Click on picture below to get your money saving coupons! I bet my husband would love those- I'll have to pick some up! My review on the weight watchers Smart Ones Breakfast English Muffin Sandwich = YUCK!!! Flavorless, cardboard texture, no cheese as shown on box. I bought the Chicken Fajitas flavor on sale and there was one thing missing....the FLAVOR!! It was like eating nothing, Nada, NO flavor at all. I'd rather get the fixings and make them myself. Maybe the other flavors are better but I won't be trying them. I want some kind of TASTE in what I eat no matter how small the portions. I totally agree! I have not tried those chicken fajitas.